We’d love your help. Let us know what’s wrong with this preview of Betting Game by Heather M. O'Connor. To ask other readers questions about Betting Game, please sign up. This review has been hidden because it contains spoilers. To view it, click here. I think it was a good book for teaching kids or teenagers a lesson of not betting. In this, her debut Young Adult Novel, Heather O’Connor sets a high standard for herself. Jack and his brother, Alex, both play for and elite soccer academy with an eye to being moved to the pros one day. Both are excellent players, but Jack has an unusual edge in that he can plan out the entire game, play for play, in his head. This makes him great at fantasy soccer where he almost never loses. Jack’s part time job with the academy’s pro team and has taught him a lot about the various players and In this, her debut Young Adult Novel, Heather O’Connor sets a high standard for herself. Jack and his brother, Alex, both play for and elite soccer academy with an eye to being moved to the pros one day. Both are excellent players, but Jack has an unusual edge in that he can plan out the entire game, play for play, in his head. This makes him great at fantasy soccer where he almost never loses. Jack’s part time job with the academy’s pro team and has taught him a lot about the various players and their abilities – another plus when playing fantasy soccer. When his dad introduces Jack to Luka, a rich young man with a keen interest in soccer, Jack is flattered to be asked about his job. He is more than willing to tell Luka all about the players, their injuries, recoveries and potential in each game. Then a new player with an attitude joins his team, leaving Jack miffed and angry and creating a rift between him and his brother. Luka’s interest in him becomes even more valuable. One thing leads to another and before long Jack is immersed in a world he never knew existed. The reader, too, becomes immersed in this world. I don’t know much about soccer and as such was wondering what some of the terminology meant but this did not detract too much from my enjoyment of the story. Perhaps a glossary describing some of the soccer terms may have helped. O’Connor has obviously done her homework in researching soccer and the seedier side of the game. The characters come across as quite believable and I must accept the premise that after all that research, her description of the game, both the good and the bad, are accurate. The story moves at a good pace and the action is ongoing enticing the reader ever onward to the next page. First off, I don’t know soccer from hockey. That makes this author a magician. For Heather O’Connor to write a gripping YA novel centred on a sport I’ve never watched, and yet craft the novel such that I can’t put it down, is a tribute to her art and her ability to channel her passion for the game. In fact, having no experience with soccer had the benefit of throwing the writing—the pitch-perfect voice, the authenticity of the school, team and home relationships, the spiky plotline, the many wond First off, I don’t know soccer from hockey. That makes this author a magician. For Heather O’Connor to write a gripping YA novel centred on a sport I’ve never watched, and yet craft the novel such that I can’t put it down, is a tribute to her art and her ability to channel her passion for the game. In fact, having no experience with soccer had the benefit of throwing the writing—the pitch-perfect voice, the authenticity of the school, team and home relationships, the spiky plotline, the many wonderful turns of phrase and metaphors—into stark relief. This author understands the mechanics of suspense. Conflict all over the place: risks, threats, stakes, surprises, betrayals. And psychology, too. One of my favourite moments was when Jack realizes one of his teammates (I won’t say who for fear of spoilers) can’t “see” the game, the way a chess player, for example, can see several moves ahead. It was a stunning insight. Chess as a metaphor throughout the novel was brilliant, by the way…a fitting addition to the author’s image system. Overall, I was so impressed by the completely believable, seemingly effortless, tension-building description of maneuvers on the field, sustained game after game. I don’t think I’ll ever know anything as well as this author knows soccer. A fast read, I finished it in a day. An entertaining enough read even if I found the consequences of the hero's actions a little unrealistic. Catches the mood and the spirit of Soccer quite well. The characters are presented with a genuine enthusiasm. The author's love for the game does shine through. Would work as a read to fill your time on a couple of long subway rides. Jack is an excellent soccer player and is on a very select team. Sadly, he makes poor choices in a new friend, Luka, who is a bookie. Luka enables Jack to make some bets and while his system works for a while, it soon breaks down and Jack owes Luka an astonishing amount of money. None of Jack's choices look good for how to get himself out of this mess. i raced through this book in one evening. though i don't know soccer, i found the action exciting and my heart was in my mouth, wondering how jack would solve his deadly problem. great story, believable characters, thrilling ending. Heather O'Connor certainly knows her football! Would recommend this for sport-loving reluctant readers. Learned lots about soccer reading this one! Great fast pace too! Heather M. O'Connor is an award-winning writer, editor and author based in Whitby, Ontario. 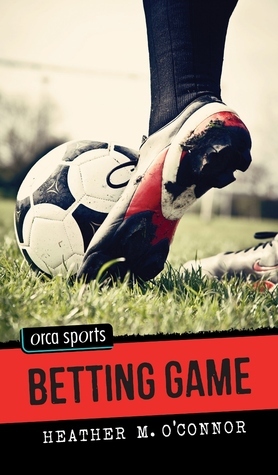 She is the author of Betting Game (Orca Books, 2015), an action-packed YA sports novel that throws an elite soccer player into the murky world of illegal gambling. Heather also writes short stories, fantasy, historical fiction and nonfiction for adults and children. Always an avid reader, she first tried her h Heather M. O'Connor is an award-winning writer, editor and author based in Whitby, Ontario. Always an avid reader, she first tried her hand at writing in 2002 when invited to write three children’s books for Nelson Canada. That’s when the writing bug really sank its teeth into her. Heather opened Merlin Writes, a freelance writing business, and started calling herself a writer. And a teacher. And an author.